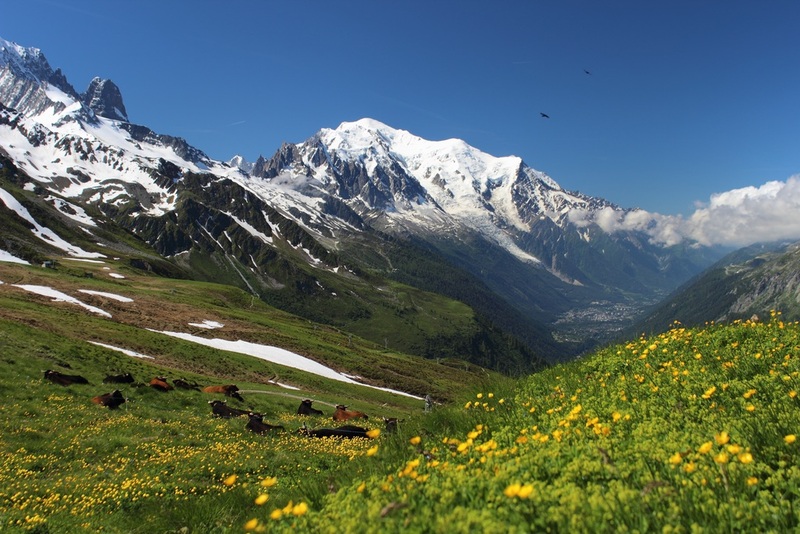 This classic alpine walk, the famous ‘TMB’ or ‘Le Tour du Mont Blanc’, circumnavigates Western Europe’s highest mountain over passes and through the valleys of three contrasting countries. 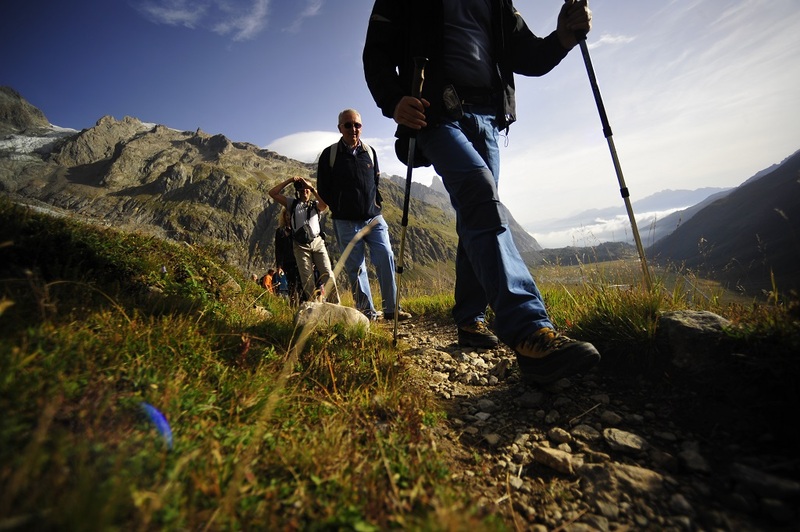 Walkers can savour the food and wine of France, Italy and Switzerland and enjoy some of the finest scenery in the world. 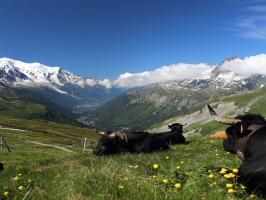 The tour follows in the path of Savoyard pedlars who crossed the Alps’ mountain passes to sell ribbons, materials and fabrics to their neighbours in Switzerland and Italy. A shared history and dialect (Franco-Provençal patois) link these mountain people in this corner of Europe. Mont Blanc is the highest mountain in Western Europe (4807m) and is a majestic and sovereign peak that overshadows the delightful mountain towns of Chamonix on the French side and Courmayear on the Italian side. 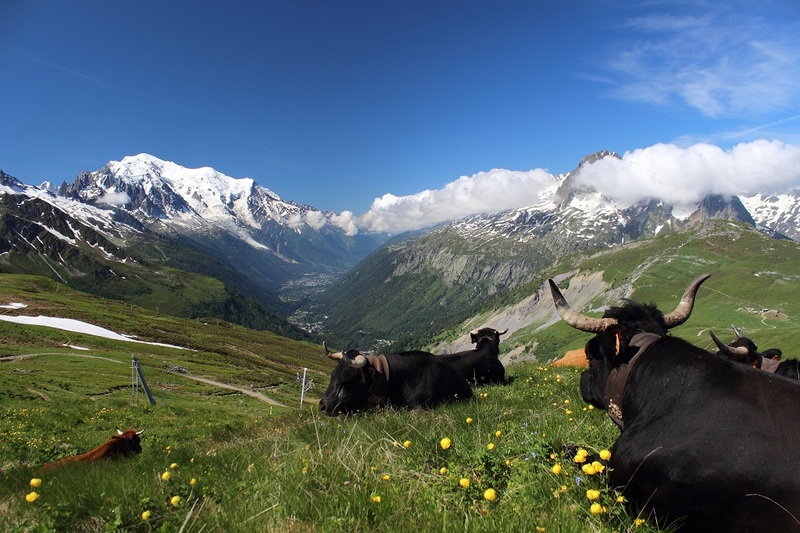 An exploration of the surrounding valleys introduces us to the intricacies of the region– from the Beaufortain foothills, where the Beaufort d´Alpage cheese has always been produced, to Swiss Ferret Valley, with its tiny mountain huts. This is a trek full of surprises, grandiose landscapes and spectacular alpine scenery – arguably one of Europe’s most wonderful trekkings. And one which allows time to savour the area, its food and relax. Arrival in Les Houches: This morning we fly to Geneva and transfer to Les Houches (see above). Coach/minibus from Geneva to Les Houches. Day 2 Les Houches to Les Contamines: 19 kms / 7 hours. A steady climb from Les Houches (950m) via Col de Voza (1653 m) and below the tip of the Bionassay glacier to the Col de Tricot (2120 m). There is a very steep descent from the col to the Chalets de Miage (1550m) followed by a short climb over Truc before descending through forest to Les Contamines (1170m). A demanding day. Many walkers start by taking the cable car up from Les Houches to Bellevue; this avoids the long slog and makes for a more enjoyable start to the tour. Day 3: Les Contamines to Les Chapieux, 17.5 kms / 7 hours. We ascend to the Col du Bonhomme (2329m) and then traverse to the slightly higher Col de la Croix de Bonhomme (2479m) Before descending to Les Chapieux. N.B. Your bags are not carried to this point – you will next see them in Italy. Carry your wash bag and a change of clothing for two days (1 night). Day 4: Les Chapieux to La Palud, 30 kms / 9 hours. The walk can be shortened to around 20km by using local buses along the Val Veni (Italy) – the bus service does not normally operate before 1 July. After a steady ascent past Ville de Glaciers, we cross the Col de la Seigne (2516m) into Italy. The Elisabetta refuge is a popular lunch stop. In summer (not before 1 July) there is a local bus service along the Val Veni from Cantine de la Visaille to La Saxe and Courmayeur, but purists can follow the strict TMB route high up on the south side of Val Veni, or follow delightful low-level paths along the Val Veni itself. From La Saxe or Courmayeur you can walk or catch the bus up to La Palud. Day 5: In La Palud. A chance for a well-deserved rest. On a clear day you may like to take the cable car from La Palud to Pointe Heilbronner (3462m) on the crest of the Mont Blanc massif with views across the Glacier du Geant. 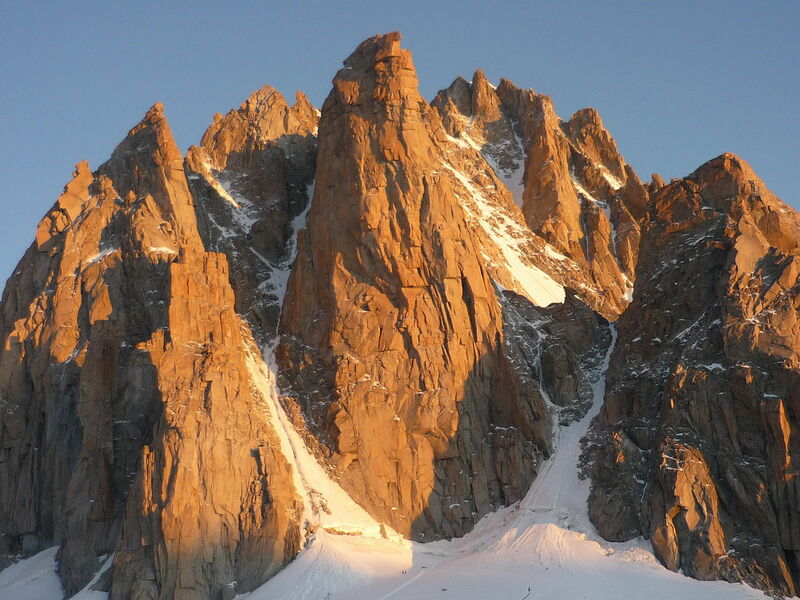 Alternatively you can trek from Courmayeur over Mont de la Saxe or Col Sapin, returning by bus from La Vachey or Pra Sec along Val Ferret to La Palud. Various walks are possible. Day 6: La Palud to La Fouly. 28 kms / 7 hours. The walk can be shortened by taking the bus to La Vachey or Arnuva. 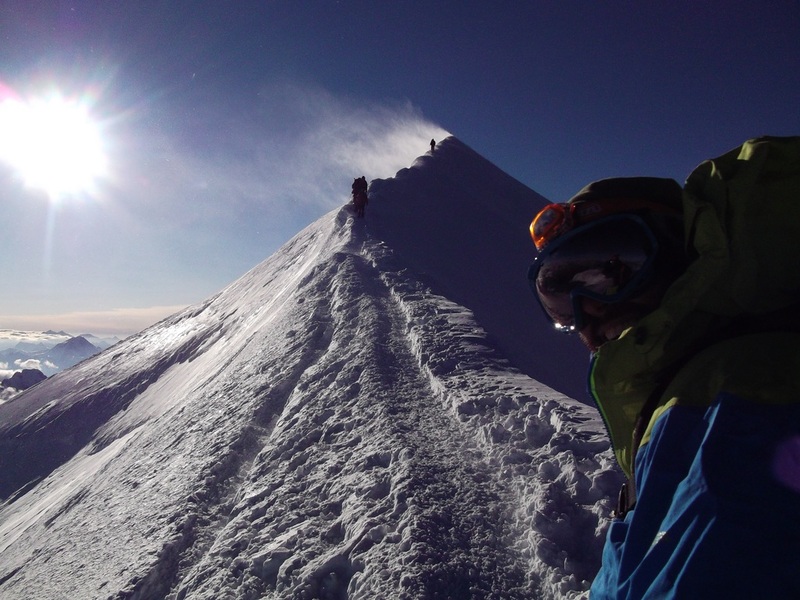 We pass close by Mont Dolent, and cross the Grand Col Ferret (2537m) to re-enter Switzerland. From Grand Col Ferret we descend through alpine meadows past the summer pastures and barns of La Peula (refreshments available) and the tiny village of Ferret to our hotel in La Fouly (1595m). Day 7: La Fouly to Champex. 17 kms/4.5 hours. We follow the beautiful Swiss Val Ferret and pass through some pretty villages before leaving the valley to climb through woods to Champex in its picturesque lakeside setting. An easy day – in warm weather there is time to cool off in the open-air swimming pool. Day 8: Rest day in Champex. A chance to stroll around the lake and visit the botanic gardens (open daily except Sundays and Mondays; small entry fee). 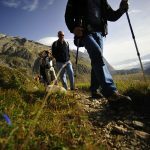 There is an abundance of day walks from Champex, of which one of the most challenging is from La Breya (upper cable car station at 2198m) to the mountain hut at Cabane d’Orny (2811m). Good weather and a head for heights are needed for this walk; we do not provide route notes but route finding is simple in good weather. Another good walk from Champex-Lac is to follow the Val d’Arpette up towards the Fenetre d’Arpette. For those who are starting to feel the lack of cultural stimulation it is possible to use the ‘rest’ day at Champex for an excursion by bus and narrow gauge train to the neighbouring town of Martigny, where the renowned Pierre Giannada gallery (www.giannada.ch) puts on some mighty summer exhibitions. In 2000 50 original Van Goghs were on show every day for 5 months, while in 2001 it was the turn of Picasso. Day 9: Champex to Trient, 20km/5 hours. We ascend through woods to reach the barns of Bovine (1987m; food and drinks usually available) and then descend to the Col de la Forclaz (1,526m; refreshments available including – in season – local tarte aux myrtilles (blueberry pie – recommended!). 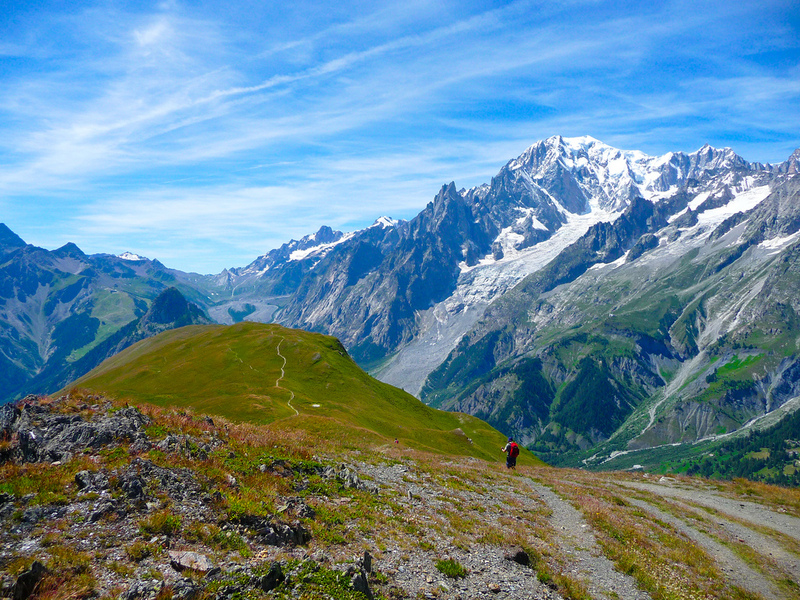 There is then the option of a walk to the Chalet du Glacier and a bit beyond for fine views of the Trient Glacier before descending to the village of Trient. Basic accommodation in rooms in a simple auberge (inn). 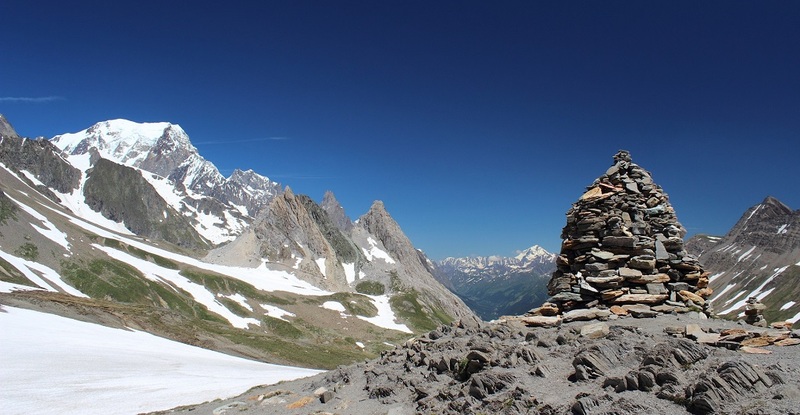 There is a strenuous and challenging variation to today’s route, over the Fenetre d’Arpette (2665m), although we consider that the ‘Bovine’ route is so scenic that it should not be missed. 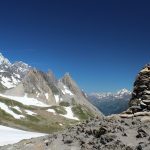 Day 10: Trient to Argentiere, 20 kms/ 6 hours. We cross into France via the Col de Balme (2191m) revealing the Chamonix Valley below and the Mont Blanc massif. On the way up to the col there is a longer but very scenic and satisfying alternative via Les Grands (head for heights an advantage at one point). 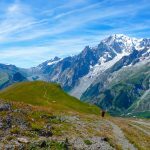 The best way on from Col de Balme is via the spectacular but easy Posettes ridge, from the end of which there is a steep descent on good paths through forest to Tre le Champ and our hotel at Argentiere. For those who want a more leisurely day, a shorter (and still scenic) descent from Col de Balme to Argentiere is possible via Le Tour. Day 11: Argentiere to Chamonix, 12 kms/5 hours. 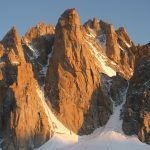 We climb via Tre le Champ (1417m) and Les Cheserys, and make a detour to the scenic Lac Blanc (2352m) before rejoining the Grand Balcon route, which looks across the Chamonix valley towards Mont Blanc. From La Flegere (1877) you can either descend to the valley at Les Praz de Chamonix on foot or by gondola & cable car. From Les Praz, you would make your way to the hotel either by bus or by walking through the pleasant environs; or continue along the Grand Balcon for another 2 hours to Plan Praz, from where there is another cable car (or rather gondola ) and another footpath down to Chamonix. It is necessary to check the timetables and keep an eye on the time so as not to miss the last gondola down. Day 12: Rest day in Chamonix. A chance to take the cable car up to the Aiguille du Midi (3842m), costly, but really worth it. Or take a train ride to Montenvers and the Mer de Glace glacier; or explore Chamonix and its surroundings. For those who might prefer something totally different from walking Chamonix boasts an Olympic standard pool and aquatic fun centre, a summer luge course, opportunities for that first paragliding flight (check your insurance), golf etc. There is also the very interesting Alpine Museum. And new art gallery. 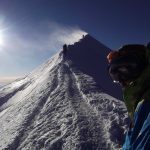 Day 13: Chamonix to Les Houches. 14 kms / 6 hours. 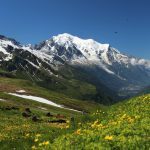 We rejoin the trail either at La Flegere, using the cable car from Les Praz de Chamonix, and continue along the Grand Balcon to Plan Praz or at Plan Praz via the Brevent cable car from Chamonix. From Plan Praz we ascend to Col de Brevent and on up to the peak of Le Brevent (2525m), one of the highest points of the tour. This day offers some of the finest views of the route. From Brevent we descend to Les Houches (1010m) and make our way to the hotel where we spend the last night. In case of bad weather or low cloud there are good low/medium level walks leading to Les Houches along the flanks of the Chamonix valley such as the ‘Petit Balcon’ and the ‘Rive d’Arve’. These walks are well marked and signposted. Day 14. Departure from Les Houches. Coach to Geneva airport after breakfast. There are no scheduled departures for this tour in 2019, but on request a tour can be planned at any date – between late May and late September – for private groups. Just contact us! We can then also personalise the tour with respect to duration and lodging. We can offer you a large selection of very good hotels, or small B&B’s. Genius Loci Travel, as the leading adventure travel company in Italy, can book your room in any hotel you could dream of! N.B. For this tour tailor-made private departures (for groups of minimum 4 persons) can be planned on any date. Availability & prices on request. Prices start from 1750 euro p.p., depending on the season, accomodation and number of persons in your private group.